Duchenne and You is a resource dedicated to those who have had their lives touched by Duchenne muscular dystrophy. As a source of knowledge, hope and ongoing support, we will help you find out what to expect and what to do next. From day one, our aim is to guide you through the Duchenne healthcare journey so your child or loved one can focus on living the best life possible. Duchenne is a rare condition, affecting around 1 in 3,600‒6,000 boys. The first noticeable signs of Duchenne are that a child does not reach developmental milestones when expected. These milestones include lifting their head, sitting, walking, and talking. Children with Duchenne may also have learning and behaviour problems, including poor attention and memory skills. Most of the time, a delay in development is nothing to worry about. Every child develops differently, and there is a wide range of what is considered to be ‘normal’. However, in rarer situations, it could be the first sign of Duchenne. One of the most important things you can do as a parent or caregiver is become aware of what skills are expected at what ages, and what your child or loved one is accomplishing. To help you keep track of this, we have created a developmental milestone checklist. This has been designed to help you identify warning signs for developmental delays in children from birth to 3 years old. Remember that every child develops differently, so slight developmental delays do not automatically mean something is wrong. However, if you suspect that your child or loved one has a developmental delay, it is important to speak to your family doctor as soon as possible. If you suspect a developmental delay, ask your family doctor for an evaluation. 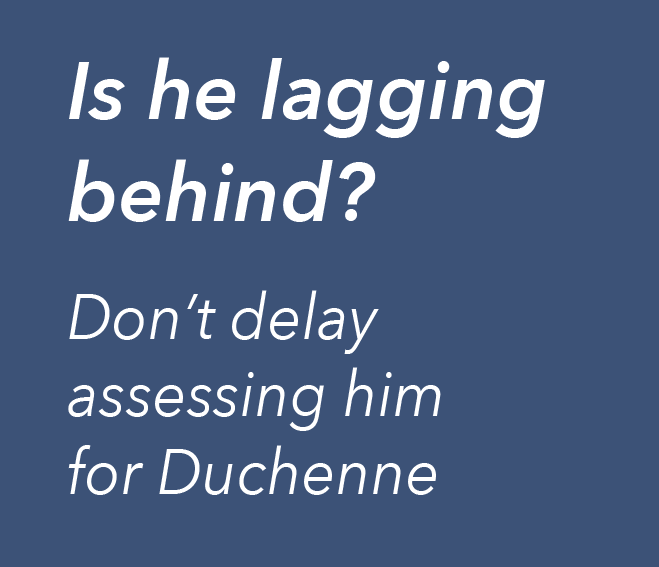 If your child or loved one has Duchenne, it is better to find out sooner rather than later. The earlier the diagnosis, the sooner your child or loved one can start to receive medical care and treatment. And the sooner this starts, the more potential there is for slowing down the disease, and helping to preserve muscle function for as long as possible. Muscular dystrophy refers to a group of genetic diseases that cause muscle weakness.  Duchenne (also called Duchenne muscular dystrophy, or DMD) is the most common and severe form of muscular dystrophy. Duchenne affects all muscles of the body – including muscles in the arms and legs, as well as the heart muscle and those involved in breathing. Genes are made up of DNA, a code that tells the cells in our body how to make proteins.  In Duchenne, a gene change (mutation) prevents the body from producing enough dystrophin. If the body does not have enough dystrophin, muscle cells become more sensitive to damage. Over time, the injured muscle cells become replaced with scar tissue and fat. When this happens, the muscles lose their strength. Over time, the person starts to have problems with movements such as getting up from the floor and walking. While the chances of having a girl with Duchenne are extremely low – approximately 1 in 50 million – it can happen. Girls affected by Duchenne normally have less severe symptoms than boys, but they may need the same treatment and care. Duchenne is progressive – this means that it gets worse as the person gets older. There is no cure for Duchenne at the present time, but, with the right care, people with Duchenne may live into their 30s and beyond. Monitoring your child or loved one's development can be confusing. The information provided here is not a substitute for professional medical advice. Please contact your doctor for more information.